How do you cosplay a character with no recognizable human features? Simple. You add some. Yes, I realize fans have ascribed various physical human attributes to GlaDOS almost from the moment she was revealed in the original Portal, but the fact remains that the character is a hanging contraption cobbled together from gears, wires and space-age polymers. 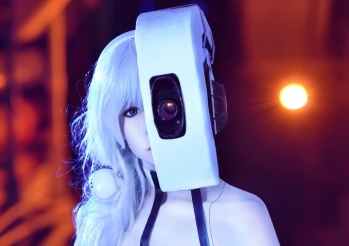 That's why it's so impressive that this GlaDOS cosplayer was able to humanize the malevolent AI, while retaining recognizable features of the original design. The overall effect is at once immediately reminiscent of Valve's creation and quite aesthetically pleasing. Translation: Brittany (that's her name) looks gorgeous. The image at top-right was captured by photographer Senen Llanos, but I highly recommend that you also have a look at Llanos' website, as well as this gallery on Brittany's blog. Though the costume may not be a perfect recreation of GlaDOS' metallic form, I kinda prefer this version. The creative license employed in the creation of this costume is very clever, and demonstrates a deep understanding of the character as well as the cosplayer's own creativity.